The Beetle Chair has since its introduction in 2013 being well received by end-consumers as well as interior architects. Due to its appealing design, outstanding comfort and unique customization possibilities, the chair can be seen in many of the most renown restaurants around the world. 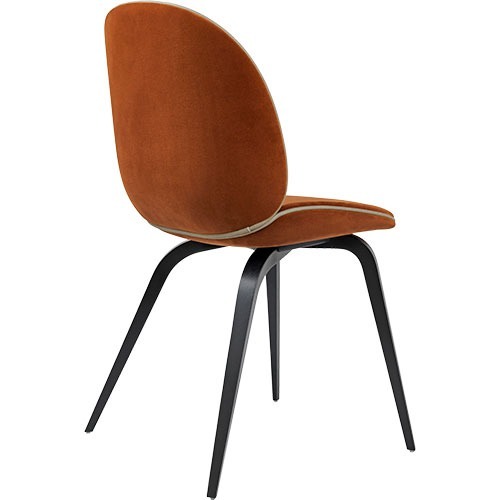 The fully upholstered chair carries strong references to the design duo GamFratesi’s inspirational source; the insect world, more specific the world of beetles. Not just the name indicates their inspiration, but also the characteristic elements of the beetles’ sections have been interpreted – shape, shells, sutures, rigid outside and soft inside. The wide range of upholstery options and different bases make it possible to put your personal touch to the chair and create one of its kind. The chair is also available with Hi-Rek Shell with seat upholstery or seat and front upholstery. Plastic glides included, felt glides available on request. The collection includes chairs, barstools, sofas and lounge chair. Other versions include swivel, castors or metal legs.